Winter is upon us! And while we are opening gifts, having a nice holiday dinner, or wishing the best for the upcoming 2018, there is one more thing we must do, and that’s to check the upcoming sequel series for 2018! On our never ending search for the best way to measure the anticipation that the fans have on the upcoming sequels, we had a super complex and exact way with only a 0.01% error margin prepared to measure the hype that the fans must feel for the series… But we decided to throw all that boring stuff away and let Nero Claudius put her opinions instead! …Yes, that Nero Claudius. No, I don´t know how she came (If you ask me I think it was either a Ouija Board session gone wrong or someone got possessed by playing too much Fate/GO), but in any case, she will be measuring it by the U.M.U.! Which of course stands for Universal Measurement Units, so get ready because here we go! 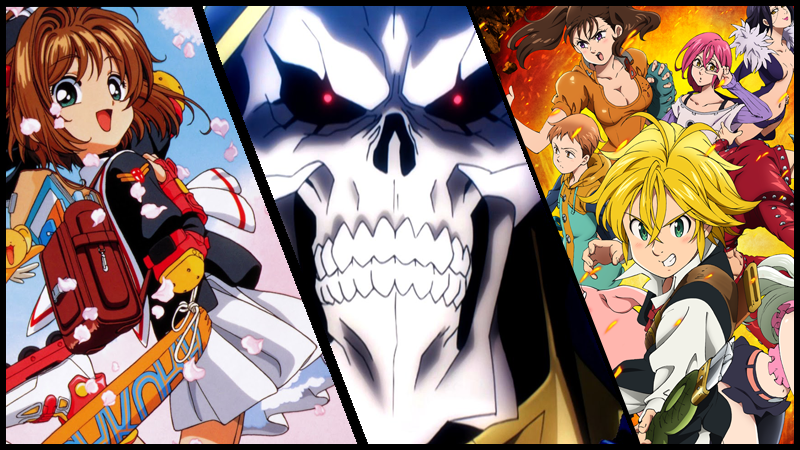 You can check out our sequel guide for the fall season. About the Series: In Japan some decades ago, the country was attacked by giant monsters called Kaijuu. Luckily, such menaces have been obliterated now and everything is at peace… Still, the relentless soul of such giant monsters are now slumbering inside the bodies of different girls. These Kaiju Girls now use the powers of the monster inside of them in order to keep the world at peace! Now the new Kaiju Girls: Agira, Miclas, and Windom will have to learn to dominate their power while having a good time doing so! This season is the sequel after the events of the first season and the introduction of a new main character that will accompany our 3 main girls. Universal Measurement Units (UMUs): These girls look cute, and clearly they have power being monsters. No matter how many there are, collectively they will never have the beauty and strength of the one true ruler of Rome (that’s me!). About the Series: Nono Hana is a simple 8th grade girl with only one wish… to be an older sister. Therefore she is always smiling and caring for others like how a Big Sis would be. One day, she encounters the Baby-being Hug-Tan and her Fairy Guardian Harry; they are being chased by an evil organization called “Dark Tomorrow” in order to retrieve the Mirai Crystal from Hug-Tan! For that, Hana decides to help them and uses the Mirai Crystal to transform into Cure Yell! The new generation of PreCure is now here! Universal Measurement Units: If there is one thing I hate, it is abstinence. What is life without the flames of passion, the aroma of love, and the showering of praise? Over 100 hours of needing to catch up for this series? No “Umu” for you! Time to Catch Up: More than 100 hours divided in various PreCure shows. About the Series: Suigin Riku is a poor young boy who in order to afford his education has many part-time jobs. But at the same time, he is one amazing video game player, specifically in the game Dungeon Century. After the notice came that the game was going to be shut down, he and his friend, the beautiful Rei Riku, go to search for a new game, the game of their choice being “Grave Buster”. However, after Rei gets kidnapped, Riku enters the game of Grave Buster with the sole intention of rescuing her while at the same time solving the mysteries surrounding this video game! Universal Measurement Units: Umu, I love games. I, of course, am always the winner whenever I play. This series looks low on fans, but if it is a game of some sort we are discussing here, I shall win it. About the Series: In China, during the Shang Dynasty, the beautiful Fox Spirit Dakki is controlling the Emperor to do her bidding and spread the evil on the whole land. At the same time, a young boy named Taikobo is part of a special mission, the Houshin Project, which consists of hunting down all the Demonic beings in the world and sealing them away! His path will lead him to Dakki, who was the destroyer of his hometown! Universal Measurement Units: Hear me well, never trust the lies of a dirty fox spirit. They are nothing more than lewd witches! If someone wants to make an emperor’s decisions, they should absolutely earn their role...like I did….absolutely...earned. About the Series: It’s the year 2205, and historical revisionists are trying to change the flux of time for their own interest! For that, the group called the Saniwa, historical swords now in the form of Handsome men, are the only ones who can defeat them! This is the story of the cheerful lives of these young men in a certain citadel. Universal Measurement Units: Umu, I can always appreciate good aesthetic taste in handsome men. None match my majesty, however if a series is rich in men who could be given an audience by me, I will gladly watch. About the Series: Saiki Kusuo might look like a normal guy, but in truth, he has telepathic (and other) super powers. And yet, rather than being a blessing that he can use for his own good… these powers are a curse, and ones that attract all kind of weirdos! This is the story of the epic struggle of Saiki and his dream of having a normal life! Universal Measurement Units: Umu! The people’s choice right here. When this series of shorts concluded in the later part of 2016, it won over fans much like how audiences are won over by my angelic singing voice. Sing on, we shall see more! About the Series: Hell has been unified by the Seven Mortal Sins. The influence of these demonic beings is spreading at great speed and it’s affecting the human world. Therefore, the forces of Heaven, led by the Angels that represents the Seven Heavenly Virtues, have decided to go to Earth and search for the “True Messiah” to destroy this crisis! Universal Measurement Units: The passionate flames of summer, the beauty of a rose, my stunning looks- all of these are synonymous with the summer. What wasn’t thought of this summer? How much fans slammed this series. To each their own I say! It builds confidence! In the 2005 series, two ninja clans harbored deep hatred and animosity towards each other since ancient times but were forced into an armistice by the shogun. However, after the shogun died, each of his two sons contracted one of the clans to fight to the death to determine who would be the next shogun. Which is a problem when a young couple from the opposing clans who are meant to be the next leaders, have fallen in love. What follows is an ultra violence battle royale to the death. This sequel is supposed to take place 10 years after the events of the 2005 series, with presumably, another ninja war upcoming to tear through these clans once again. Universal Measurement Units: Oh yes, this is a very good series from way back in the historical time that was 2005. How do I know about 2005? Why are you questioning my supreme power? About the Series: Following its airing in 1998, Cardcaptor Sakura became one of the defining series of the magical girl genre and its mangaka’s, CLAMP’s, biggest hit. Clear Card, based on the manga of the same name, is set a year following the events of the original series as Sakura and her friends enter Junior High School including her now-boyfriend Li Syaoran who has returned from Hong Kong. Despite the Clow Cards being successfully transformed into Sakura Cards declaring Sakura the new undisputed master of the Cards, a new magical threat arises in Tomoeda, as following a dream involving a masked figure, the Sakura Cards turn clear and start causing havoc once more. This begins a new card-capturing adventure as Sakura and friends try to uncover the mystery of the masked figure. Universal Measurement Units: I love things cute. If you don’t think this show is cute, you are a liar! SHAME ON YOU! About the Series: Ten years ago, a group of knights named the Seven Deadly Sins planned to overthrow Britannia’s Liones Kingdom. They were said to have been defeated by the Holy Knights, who then captured the king and became the new rulers of the kingdom. However, the rumors around the region began to spread, saying that the Seven Deadly Sins are in fact still alive. This rumor manages to reach the ears of Elizabeth, third princess of the kingdom. With these words in mind, she sets out to take back her kingdom by enlisting the help of the Seven Deadly Sins—if she can find them, that is. About the Series: After hundreds of episodes and over ten years of Odd Jobs making mayhem in Edo, the final season of Gintama is upon us! Remaining spoiler-free for the sake of new viewers, the plot is barreling towards its climax, converging every remaining character and plot thread on our humble blue planet for a (hopefully) epic finale. It’s sure to be a spectacle, filled with laughs and tears, and if you hold any desire to watch Gintama as it airs, this will likely be your last chance! Universal Measurement Units: Had there not been a series starring yours truly, I would say this would be the best on this list. Silver is just as valuable ( if not more) to many folk! Laugh! Cry! I do both! About the Series: Kokonotsu’s family runs a shop selling dagashi, which are cheap Japanese candies. He’d like to give up the shop to follow his dream of being a manga artist, but the unexpected arrival of a girl named Hotaru throws a wrench in his plans. You see, Hotaru really loves dagashi. She loves dagashi more than you’ve probably loved anything in your life, and is on a mission to spread that love around the world — or at least to those in her immediate vicinity. The show runs through a number of scenarios with Kokonotsu and friends, each focusing on a new dagashi and the characters’ daily interactions (some of which put Hotaru in vaguely… compromising positions). This season will apparently have shorter 15 minute episodes, rather than the original’s 24, which could actually work better for the show’s low-key, skit-based style. Universal Measurement Units: Modesty is for chumps! This over the top series makes some uncomfortable, but oh goodness it is fun to have a good laugh over this kind of humor when it works. Less chance to blunder the humor works- I did the same whenever I gave my people mere seconds to laugh in reaction to my jokes! About the Series: Fate/Extra Last Encore is an anime adaption of the PSP Fate spin-off, Fate/Extra. Set in an alternate universe to Fate/stay night, Fate/Extra follows the amnesiac Hakuno Kishinami who is thrown into the Moon Cell, an artificial holy grail simulation. The twist here though is that where losing not only results in you kicked out of the competition for the holy grail, but also your death. Our hero, thrust into the Moon Cell without any recollection of the past, is tasked with not only surviving this Holy Grail War, but to figure out the essential question of who they exactly are. The game had a great story but terrible gameplay, so this might be the definitive version to experience this story, but that all depends on how SHAFT handles it. The show’s worth a watch if you’re a Fate fan or if you’re just interested in a fascinating action anime. Given its entirely different premise, you don’t really need to see anything before watching this anime, but there are recurring characters from Fate/stay night and your experience would be better if you were familiar with that work. Perfection! Nevermind those other titles with “Fate” in front of them, this is the one true series you need to watch. Action, animation, and amazement. What do you mean I haven’t been doing this properly? Stay away from me, this is important! LIFT THE CURTAINS I SAY. HERE COMES MY SOLO. WITNESS A BLOSSOMING ROSE. WATCH THIS SERIES AND FEEL ALL OF THE PASSION. About the Series: Yowamushi Pedal is back for its 4th season, and we continue the story of Otaku biking main character Onoda Sakamichi and the Sohaku bicycling club as they try to become the inter-high cycling champions once again. I encourage everyone, even those who don’t think this is their cup of tea, to watch this series as Yowapedal is a fun and addicting watch that is enjoyable and engaging throughout. It’s filled with an interesting and colorful cast that makes every moment shine. Highly recommended! Universal Measurement Units: Umu, umu. I like these costumes. About the Series: Overlord is the tale of an ordinary young man who’s most greatest accomplishment is being the leader of Ains Ooal Gown, the most powerful guild in the world of VR MMORPG, Yggdrasil. That game is to be shut down, however, and our protagonist, in his guise as the lich mage Momonga, decides to stay logged in until the end. IMAGINE HIS SHOCK when he is somehow transported to an actual fantasy world along with his guild headquarters and his NPC followers, who are all now real and sentient. Oh, and he’s now stuck in the form of his avatar! This is a strange new world, but as long as he’s here, he may as well be OVERLORD of it. Ains Ooal Gown shall reign supreme! Season 1 was excellent, but moved a bit slow as it established Momonga’s new situation, world, and the characters of his underlings. It also only had 12 episodes to work with. Season 2 promises to pick up the pace considerably as he encounters more factions and groups in his new world and continues to spread the dominance of Ains Ooal Gown. One thing we can be sure of, there’s gonna some hot Lizardman action! No, not like that. Even commoners need to entertain fantasies of ruling, I understand. The glory of combat, the joys of victory, the spoils of war! Umu! I’m in! About the Series: The Outcast is based on a Chinese web comic, and it is, well, nuts. Long, weird story short: Our protagonist, Cho Soran, finds his family graveyard torn up and is attacked by zombies, only to be saved by am extremely strange, seemingly immortal girl named HouHou, who then also shows up at his university. Turns out he may be the heir to a great power, and several shadowy organizations, including the one HouHou is with, want to either recruit or kill him for it. He then spends most of the series whining and being indecisive. Did I mention Houhou’s secret organization has a public front as a package delivery company? Like if FedEx was a front for the X-Men. Season 2 picks up right where the first left off, with Soran now a willing participant in this underground of people with strange powers. And like any good action series, were getting a tournament! The trailers actually look kind of promising and suggest the animation has improved significantly. A show worth keeping an eye on. Do not trust anything produced by Tencent. Trust me. Steady improvements are wonderful- I personally never had to improve on anything as I was born as perfection from the gods. Oh well! Special thanks to Grex, Ishamael, Requiem, RyomaNagare, Shade, RockmanDash12, Gugsy, and Nero. You guys are amazing and this thing couldn´t be made without all of you! Also a huge thanks to the whole AniTAY community and you the reader for getting to this part of the article! Happy Holidays and Best Wishes for 2018!